The August-September seasonally weak period for stocks seems to be in play. The main reason offered is heightened US-North Korea tensions but the fact of the matter is bullish sentiment simply reached an extreme (see Rydex Trader Bullishness Surpasses 2000 Tech Bubble) and, as a number of strategists and market technicians have been pointing out on our show, this meant conditions were ripe for a correction regardless of the exact catalyst. With that said, if Barry Bannister is correct in his call for a near-term market top from current levels followed by a major peak next year with a bear market and recession in 2019 (see Barry Bannister’s Macro Outlook), investors are likely to be presented with at least one more major buying opportunity in the weeks and months ahead. Keep in mind, during bull markets, stocks remain in overbought territory for prolonged periods of time. Thus, oversold readings are much more timely as a buy signal. 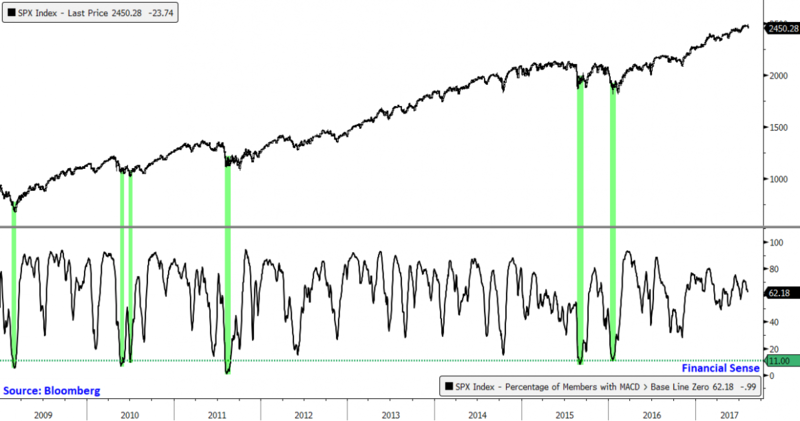 The opposite is true for bear markets where overbought readings provide more timely sell signals. Bottom line: The last major buy signal on an intermediate-term (multi-month) basis was given 10 months ago prior to Trump's election. This is the longest stretch we've seen since the 2009 market bottom and we expect it will not be too long before the next one.